Cyber Monday only comes once a year, and when it does, we like to do something really special. Today we are offering 25% OFF EVERYTHING, the biggest discount we have ever given. This discount has only ever been offered once before (during last year’s Black Friday and Cyber Monday sale), and it won’t be back again until next year. It wont be available for long, and once the sales have ended you will have to wait a whole year for it to come back (so don’t miss out)! Everyone who takes advantage of our Cyber Monday sale will also get exclusive access to 6 Cyber Monday Divi Layout Packs. 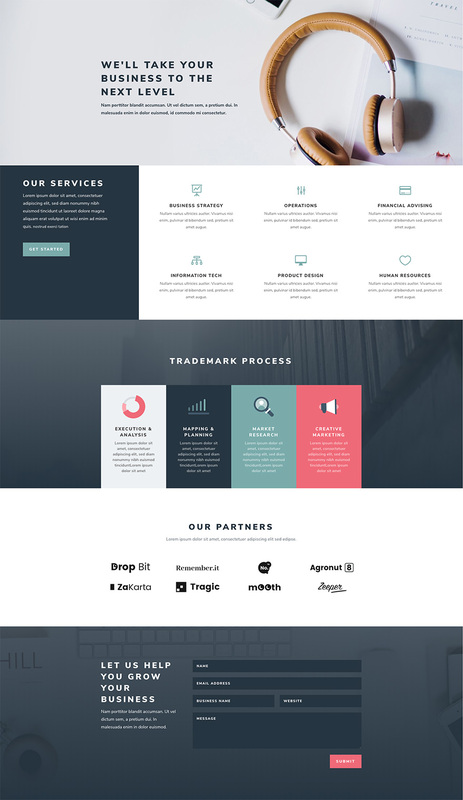 These are world-class designs built by our very own Divi design team. They are the perfect way to jump-start your next Divi websites, and they are only available to Black Friday and Cyber Monday customers and current Lifetime members. Once the sale is over, these layouts won’t be available ever again! It’s day 2 of our Cyber Monday Deal and, along with a whopping 25% discount, that means freebies! Everyone who buys a new Elegant Themes Membership or upgrades their existing account (or who already has a Lifetime Membership) will also receive 6 free and exclusive layout packs that are ONLY available for download during our Cyber Monday Sale. Download The Exclusive Layout Before It Disappears! One of the exclusive layout packs we’re providing you with is the Consultant Layout Pack that consists of 5 sleek and professional pages that are sure to make a great first impression on potential clients. Before getting into this use case, you will need to lay your hands on the exclusive Cyber Monday Consultant Layout Pack which you can get by becoming a new Elegant Themes Member, upgrading your existing account, or by already being a Lifetime Member with us. If you are indeed already a Lifetime Member you can login to our members area and download all of our exclusive layout packs here. Everyone else will need to use the button below to buy or upgrade before they can follow along with the rest of our tutorial. For the remainder of this post we’ll assume you’ve either taken advantage of our Cyber Monday deal or that you are already a Lifetime Member and have access to the Consultant Layout Pack. Once you’ve downloaded the new Consultant Layout Pack from our members area you can watch the video below to see just how easy it is to set up. We would also encourage you to follow along with this tutorial to get your site ready for further customization. Now let’s get into the use case itself. If you or your company is offering consultant services (or any services for that matter), and you have established yourself as an expert in your field, one of the best ways to win new business is to grow your mailing list. A great way to grow your mailing list is to give away something valuable to them for free – like an e-book. I won’t go in to all the studies and psychology behind it, but trust me, this works. It is one of the reasons grocery stores give away free samples. They know you are probably going to feel guilty (at least if you have a conscience) for taking free samples without buying the product. Most of the time we politely say, “thank you”, and walk away, but a good percentage of people walk away with a product they never intended on getting. 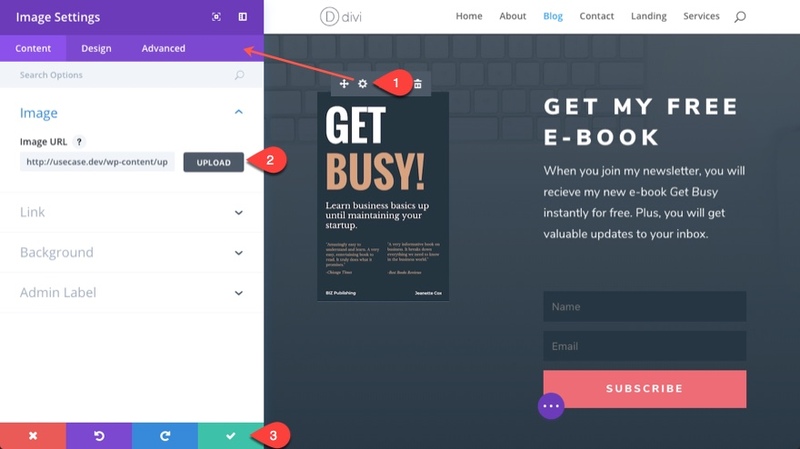 In this Divi Use Case tutorial, I’m going to show you how to create an email optin for a free e-book using Divi’s Consultant Layout pack. 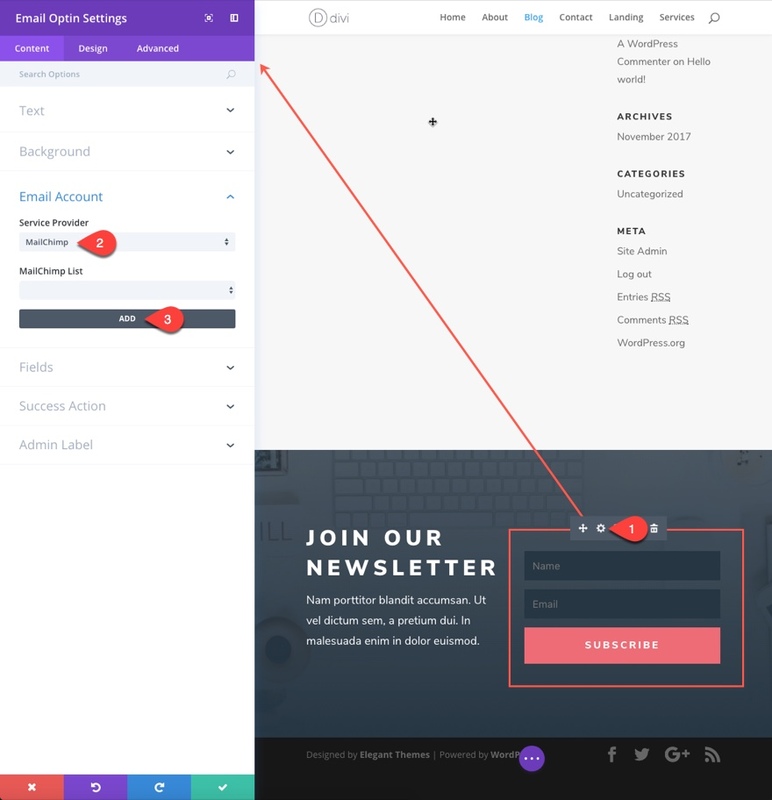 By using the Email Optin Module, you can create standout optin forms that convert. And with the integration of Mailchimp, there is no reason why any consultant or business should not be growing their email list with a free download offer. Here is a peek at the finished email opt-in form we’ll be creating. Here are a few steps to get you up and running. 2. 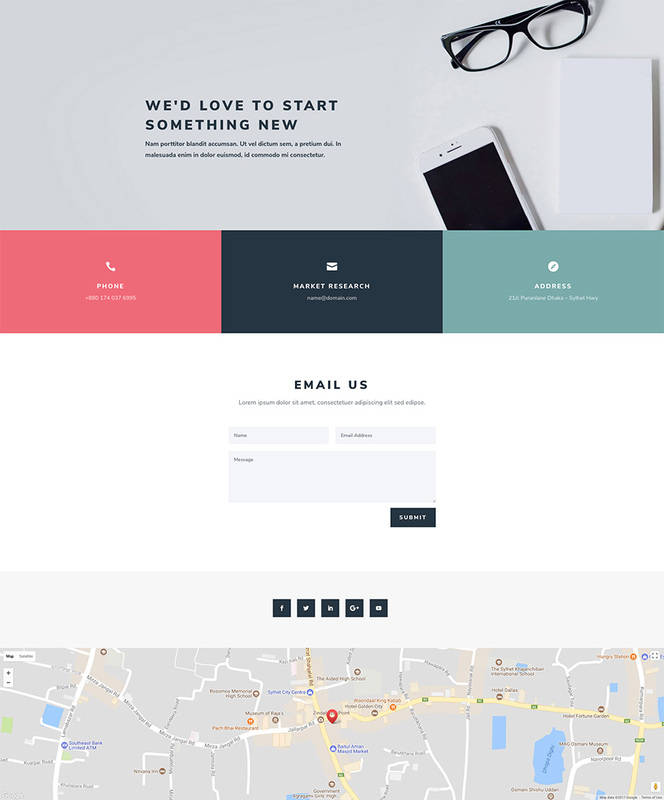 Download the Layout Pack and Import the consultant_all.json file to your Divi Theme Library. Creating an email marketing campaign is kinda overwhelming to think about if you don’t know what you are doing. If that’s you, don’t give up! It is really pretty simple to get things started. And all you really need at this point is one email with a download link to your e-book. You don’t have to have a full campaign. Start small. You can always build upon a good foundation. First you need to go to mailchimp and sign up for a free account. After that, login in and you should see your account dashboard. From the dashboard, click Lists from the top navigation bar. Then click Create List. Fill in the necessary information and save your new list. Once your new list appears in the list click to edit the list. Note: Remember what you name your list because you will need to recall that name when integrating your list with Bloom or the email optin module. Next click the signup forms link in the navigation menu. Under signup forms, click general forms. 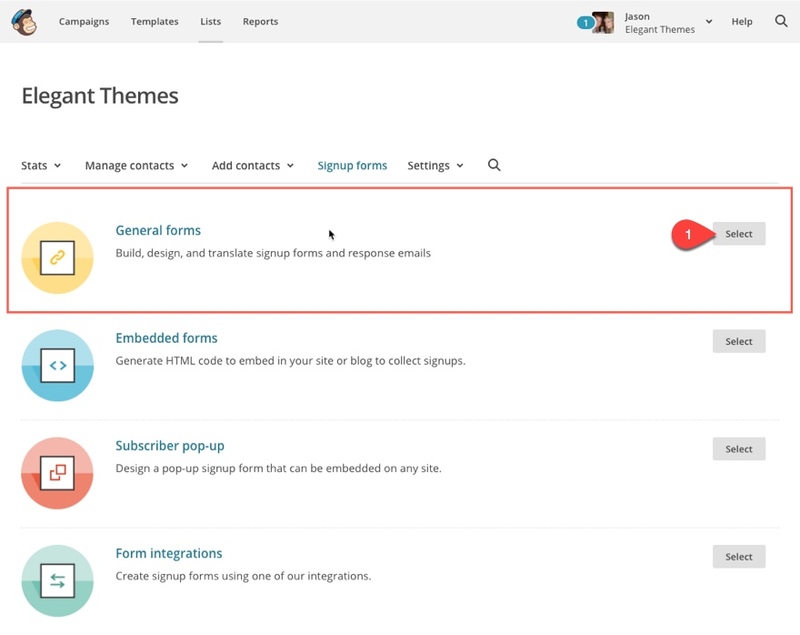 Find the Forms and response emails dropdown menu and select the Final welcome email. On the Build it tab, click inside the dashed lines to open the editor. Type some text, like “Download E-Book Here,” and highlight it. Then, click the Link icon. In the Insert or Edit Link modal, choose File from the drop-down menu. Choose or upload your file, and click Insert. 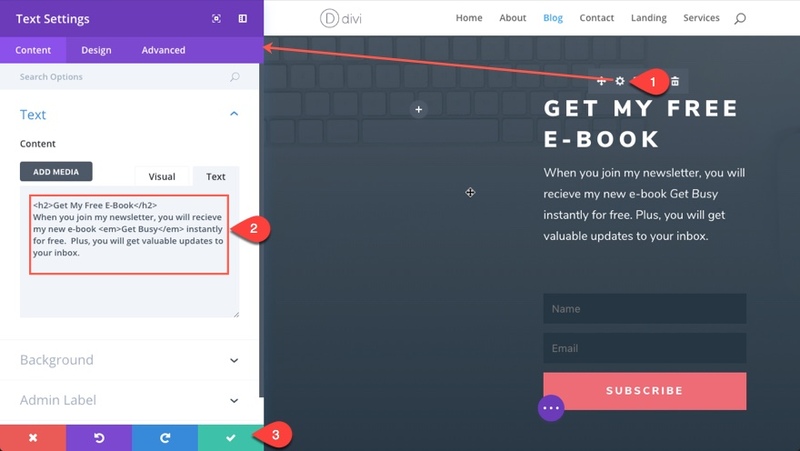 When your content is how you want, click Save & Close to return to the Form Builder. Now, when a visitor subscribes to your list, they will recieve a final welcome email with a link to download the free ebook you promised them. Now that you have Mailchimp up and running, you can choose to add your file to the first email in an autoresponder campaign. Basically, this would involve creating a campaign that is automated to welcome new subscribers. Then edit the default email in your welcome message automation to include the download link to your e-book. With an autoresponder, you can keep adding emails in a sequence that will be delivered to your subscribers over a period of time. If you are interested, you can learn how to set up autoresponders in mailchimp step by step and then add your file to a welcome automation. Now that MailChimp is taken care of, hope over to your website and let’s get started on that email optin form. 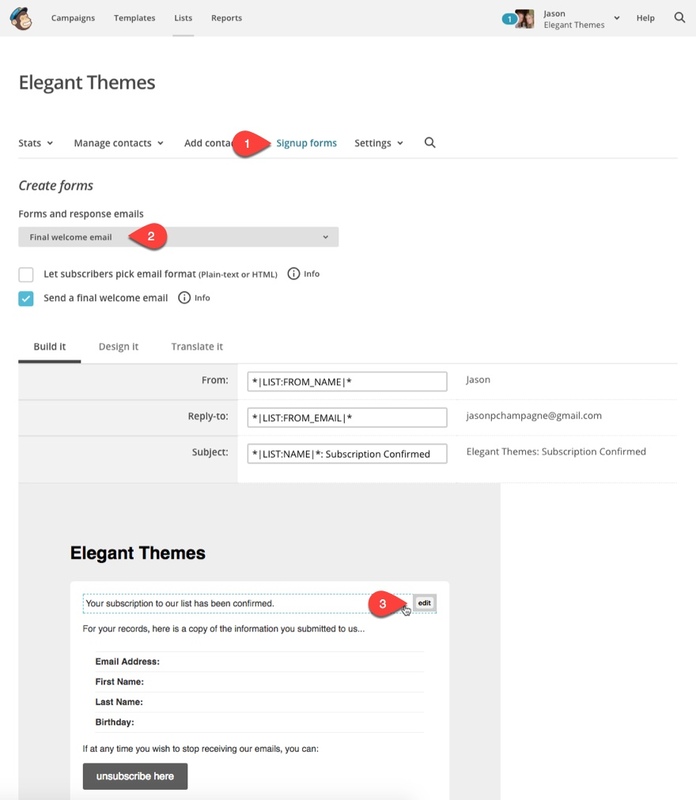 You can find the Email Optin module at the bottom of the blog page layout of the Consultant layout pack. Using the Visual Builder, click to edit the email optin module. 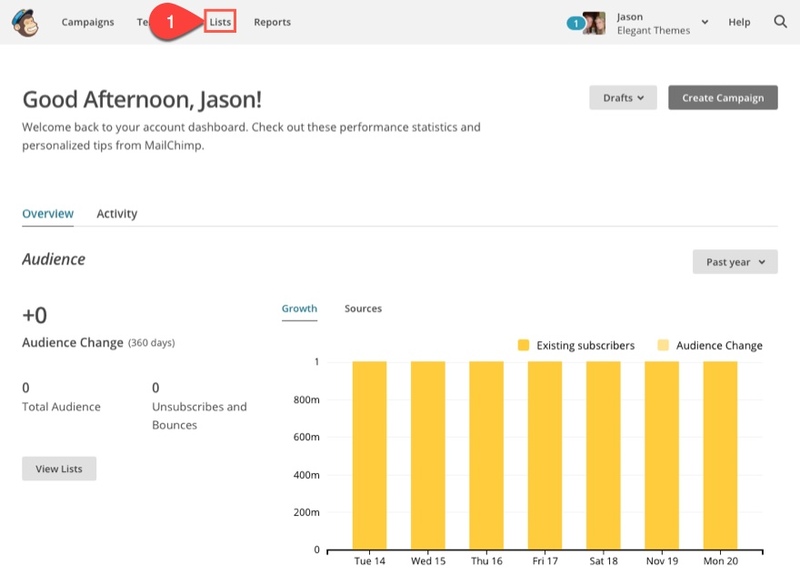 From the Email Optin Settings, go to the email account section and enter MailChimp for the service provider option. 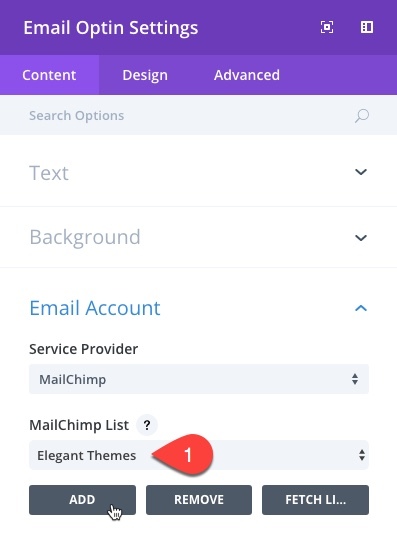 Then click the add button under the MailChimp List option to add your mailchimp list. 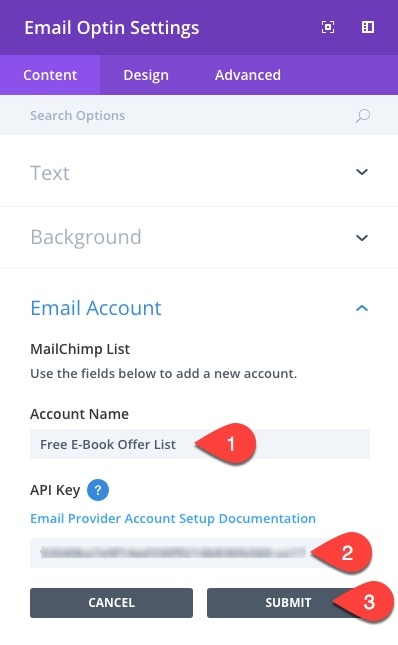 Enter the Account Name (a name to associate with the new list you are adding) and an API Key to integrate with your Mailchimp account. Then click Submit. Now your list(s) should show up in the MailChimp List dropdown menu. Select the list from the dropdown and you are done. Now you are ready to customize the section showcasing your email optin to reflect the free e-book offer. When you join my newsletter, you will recieve my new e-book <em>Get Busy</em> instantly for free. Plus, you will get valuable updates to your inbox. Now in the left column of your row, add an image module and upload your e-book image and save your settings. Tip: A good width for your image here is around 300px. And depending on your image, you may need to go to the design tab and change the image alignment to centered. That’s it! Now you have email optin form with a functional Free e-book offer that is linked to your mailing list. Now that you have this email optin created. You can save your section as a global item and start adding it to multiple places throughout your website. For instance, you can even use it as a header for a landing page. Take your email marketing campaign to the next level by creating an email optin form with our Bloom plugin. This is guaranteed to help you with lead generation. And, since you already have the MailChimp list ready to integrate, this makes this process a lot easier. Seize the opportunity and become a member today by going to our Cyber Monday Deal Page. Hi, what happened to the Divi Design initiative layouts for this week? I can’t find this week’s layout. Nice products, Nice Layouts, Nice everything. I welcome your adding of borders, shadows and animations. How about adding ‘hover effects’ module? How about adding the effects that can be set to rows and modules also to columns? Right now it’s pretty freaking lousy having to ‘borrow’ the styling’s CSS from a module so it can be manually added to a column as custom CSS. While I’m at it… I’d also like to see the ability to save your own presets and globally setting effects, ÇSS classes and CSS IDs (all so they can be overridden/removed on a per-placed-module basis) on modules through the customizer. This is definitely my favorite layout out of the six. Is this available to those of us who are already lifetime members? 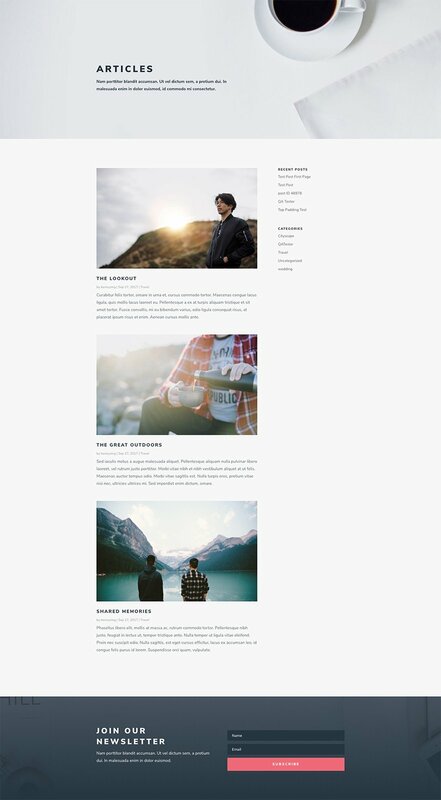 BTW, it should be nice to have some links in members area to directly download themes you show on the blog. Nathan, is this different from the black friday consultant layout pack? Where do I find the packs? When I login I am taken to the main Members Area and there are no packs to download. I’ve also been searching for the past 30 minutes and can’t find them. Yes- if we’re already lifetime members can we get this pack as well? the same…. When I login I am taken to the main Members Area and there are no packs to download. What about your lifetime members? Not available? I bought a lifetime membership, on the assumption this sort of stuff would be free of charge. Is that not the case ? Don’t seem to be eligible to download this if I have been paying yearly though for the last 3 and half years. This is a great layout. Do I have to signup the lifetime membership to download this layout? I have been a member since 2010, when the “Developer” upgrade was a one-off (lifetime) payment in addition to the annual membership fee. With this limitation now it seems that we do not have access to everything anymore unless we pay yet another upgrade to “lifetime”. I feel a bit duped. Please consider including your original developer members in any downloadable membership content. I agree and also feel slighted. Current paying customers should get something. I LOVE DIVI!!! I really do! That’s why I’m a paying client. I just have to say though… All these layouts (lately), in my opinion, are more or less the same thing. In my opinion this is a disservice to the real power of Divi. In reality Divi rocks!!! I think to many of us, Divi is also about variety, flexibility, creativity, ease of use with a front end editor (for those who want it), and a backend one (for those who like to tinker with the mechanics) – I think the layouts as of late, are not truly showcasing the variety of Divi, or even the flexibility, rather they seem to cast the light of “cookie cutter” mediocrity upon Divi. Do I love Divi – Totally yes!!! You bet I do!! Please Divi… When marketing layouts to capture interest and sell the product, please have the same attention to quality, variety, and flexibility, that you put into the product. Why did you guys stop the option to preview the layouts? Helps a lot to see them in action. They all look much different live than in screenshot images. Hmmm! You have been described it very well. I am planning to prepare a E-book,so this will help a lot in my work. Does it need bloom to be installed and does it uses bloom optin functions or is it right from inside Divi without using Bloom?